The scene at the Henderson Brewing Co. was an oddball one: lost boys tumbling around, playing music on box-drums and guitars, while folks out for a Saturday evening drink chattered away in the background. There’s no real thematic link between beer and Peter Pan that I can think of—but it was a nice bonus for many of the parents in the audience. Bad Hats Theatre’s folk-musical interpretation of the J.M. Barrie classic Peter Pan has three main things going for it. The first is a high-energy and thoroughly likeable cast. Fiona Sauder is a strong lead, playing a sprightly and boyish Peter, as thoughtless and flighty as his fairy companion Tinkerbell (herself played alternately by a bell and a glowing ball, vocalized by a hilariously mumbling Reanne Spitzer). Graham Conway as Captain Hook plays up the character as an 18th-century dandy, alternately pathetic and intimidating. He’s wonderful to watch, snarling and wailing in equal measure. Their rivalry is great fun here. Rounding out the cast, we have Lena Maripu as a lovely Wendy, who plays the part with charming earnestness and beautiful vocals, and a whole host of rambunctious, likeable lost boys who make up the ensemble: Jocelyn Adema, Matthew Finlan, Tal Shulman, and Dan Volchok. Particular tribute must be paid to Matt Pilipiak, who does double duty as J.M. Barrie-style narrator, and Mr. Smee. Whether or not the narrator is literally meant to be Barrie or simply meant to recall him, I was oddly touched by those moments when Sauder and Pilipiak (as Peter and Barrie) broke the narrative wall and interacted—particularly in the show’s final moments. There’s something nuanced and moving going on between creator and creation—or perhaps reader and subject—that defies words, and much of that is achieved by Pilipiak’s total willingness to embrace how deeply his character seems to be moved by the story he’s reading. The whole cast was great at engaging the kids in the audience (who get their own section of the ‘theatre’ right up front), at times ignoring the adults altogether. It was a nice touch, and fitting that they should be treated as special guests. The interactive moments, where children were asked to play minor parts or sing along to will Tinkerbell back to life, were minimal but well-placed when they did appear. The second thing the show has going for it is some inventive and imaginative staging, achieved by minimal props. A giant chest is used to simulate the crocodile, while Tinkerbell’s manic flying is simulated by cast members tossing a glittering ball back and forth to one another while a bell rings. Completing the show’s engaging visual identity are some beautiful costumes by Amy Wallace, who clothes the lost boys as wild little pirates in earth tones, letting the pure-white nightclothes of the Darling children stand out all the more. Finally we have the music, played live by the cast. There are mood-setting pieces and full-blown songs, all of which have an earthy atmosphere and a folky vibe. Happily, one of the best songs is saved for the very end, with a rousing finale that ended in a standing ovation. I was humming it on the way out, and would love to have a listen to the entire songbook a second time. Some drawbacks do come with the brewery venue, however. While it’s great to be able to grab a beer and drink while you watch, the active bar at the Henderson Brewing Co. occasionally overpowered the actors. I especially had a harder time hearing if they were facing away from me, or further away. The arrangement of seats in a space not meant for a stage also means that someone’s head will likely be right in your face—a note for shorter folks to arrive early and grab that front row. I was second row and definitely had to swivel a bit to catch everything, occasionally missing a bit of staging. (Update: I have subsequently been made aware that future breweries will have their own spaces, so hopefully this isn’t an issue for future dates). Overall, though, it’s evident that a lot of love has been poured into this production, and it shows. It’s hard not to be won over by the eagerness of the cast, the playfulness of the music, the creativity of the staging. At an hour and a half, I think this is a great show for kids in particular, and as a childless guest, I also had a great time. Check it out before it finishes its tour on December 10th! 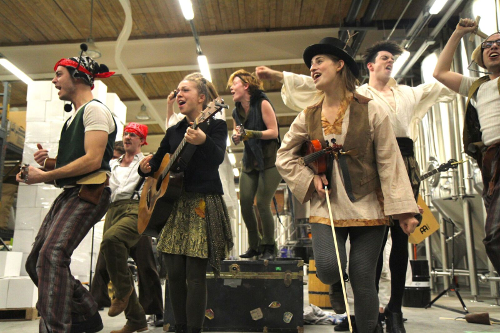 Peter Pan is playing from December 2 – December 10 at various breweries across Toronto. Featured breweries include: the Bandit Brewery on December 4th at 2pm; Left Field Brewery on December 6th and 7th at 7pm; Burdock Brewery and Music Hall on December 8th and 9th at 7pm, and December 10th at 2pm and 7pm. Ticket prices range from $20 for adults and $10 for kids (up to 17). Tickets can be purchased online.